Jason Fitger is a beleaguered professor of creative writing and literature at Payne University, a small and not very distinguished liberal arts college in the midwest. His department is facing draconian cuts and squalid quarters, while one floor above them the Economics Department is getting lavishly remodeled offices. His once-promising writing career is in the doldrums, as is his romantic life, in part as the result of his unwise use of his private affairs for his novels. His star (he thinks) student can’t catch a break with his brilliant (he thinks) work Accountant in a Bordello, based on Melville’s Bartleby. In short, his life is a tale of woe, and the vehicle this droll and inventive novel uses to tell that tale is a series of hilarious letters of recommendation that Fitger is endlessly called upon by his students and colleagues to produce, each one of which is a small masterpiece of high dudgeon, low spirits, and passive-aggressive strategies. If any of you have worked or taught in higher education, especially in the arts and humanities… yeah. I had a lot of great laughs from Dear Committee Members—several statements in Fitger’s letters nail life in academia right on the head. Fitger bemoans the seemingly endless pile of recommendation letters he’s asked to write, even from students he doesn’t know, as well as cuts to his department (English) while other departments (Economics) get perks and upgrades. 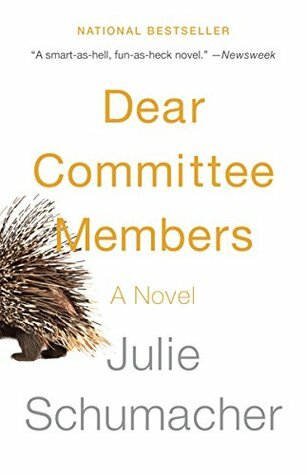 Presented entirely in epistolary form, the letters start out being humorous and to-the-point, and as Fitger slips in (ridiculously inappropriate for recommendation letters) more and more personal information and woes, the book takes a few minor twists and turns I didn’t see coming. The underlying commentary on the state of academic affairs nowadays is ever-present through the funny and serious parts of the book; both the sentiment and the cranky professor character are recognizable. Dear Committee Members was brief, silly, and bittersweet. Listened to audiobook from February 23 to 27, 2016. This entry was posted in books and tagged academia, academics, contemporary literature, education, fiction, humor, mental health by kristin @ my little heart melodies. Bookmark the permalink. I loved this book, but never considered how it would translate to audio. Glad that it worked for you.